Like the Reebok flagship opened a year ago in New York on 5th Avenue, Reebok is opening its first concept store (Fithub) and CrossFit Box at 31 Avenue de l'Opera, one of the most beautiful avenues in Paris! 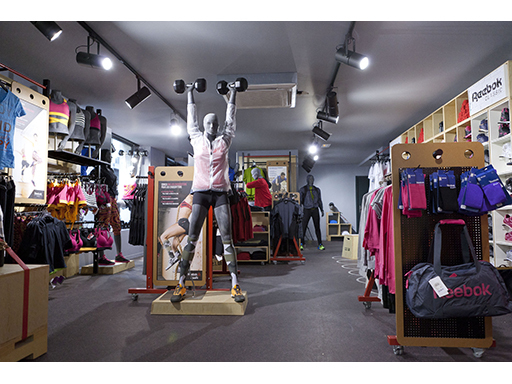 This original and innovative concept combines a Reebok shop and a CrossFit gym. An unprecedented place for a brand, shopping and sporting experience. Strengthened by its inheritance, Reebok, the ultimate fitness brand, states its clear ambitions: to be the leading fitness brand and make fitness a daily lifestyle, reaching out beyond the gym and to make each of us "Fit For Life". The Reebok Fithub and Reebok CrossFit Box will become a special place for everyone who wants to lead an active and healthy life, in a friendly and lively atmosphere. Decoration inspired by CrossFit rooms and gyms, with a mix of materials, steel and wood for the furniture. A modern, raw, creative and innovative environment where consumers are instantly immersed in the brand and sporting world. A sales team of sports, fitness and wellness enthusiasts. All have solid experience in these fields, allowing them to offer clients the best advice on how to choose products most suited to their needs and style and on their training programs. Clients will find the flagship products of the 2013 Fall/Winter collection (textiles and footwear) specially designed for Dance, studio, Yoga, CrossFit, training and running. Technical ranges for exceptional performance and comfort. A collection of Reebok Classic shoes will complete the product range as will an accessory line including luggage, socks, caps, etc. 2014 Spring/Summer ranges will also be previewed. These openings are the result of the Reebok's mission: to give everyone the desire and the means to be fit every day, bring together all fitness fans and let them live bold, rewarding and different experiences. With these new, highly diverse fitness practices Reebok allows everyone to become more fulfilled and mentally, physically and socially stronger. Through the Reebok Fithub, each person will "experience" the brand in their own unique and exceptional way. Open Monday to Saturday 10 a.m. to 8 p.m.